Some ran in superhero costumes in the sweltering heat, some ran to raise money for charity, some wanted to beat the clock and some, well, just love running. Regardless of their reason, the Standard Chartered Singapore Marathon (SCSM), held yesterday against the backdrop of the city's waterfront, continues to be a colourful and vibrant fixture on the Republic's sporting calendar. For the fourth edition running, Kenyans swept both elite categories as some 30,000 participants pounded the streets in the downtown area. The two-day event saw 50,000 participants in total. Joshua Kipkorir was the top man in 2hr 12min 20sec while Priscah Cherono was the first woman past the tape after taking 2:32:12 to complete 42.195km. They were followed by compatriots Felix Kirwa (2:13:43) and Andrew Kimtai (2:14:30) in the men's race, and Stella Barsosio (2:33:23) and Jane Jelagat (2:35:38) in the women's. Kipkorir and Cherono both speak halting English but there was no denying their joy in winning the US$50,000 (S$68,000) prize each. "This is my first time here. I like the course, it's very nice. I have no problems with the heat," said Kipkorir, 24, who opened up a 300m gap at the halfway mark for a lead he never relinquished. He upset the top names in the field, with favourite Paul Lonyangata, the winner of the last two Paris marathons, failing to finish. Cherono, 38, said: "I was worried about the weather yesterday because it was not so good (it rained overnight on Saturday) but today, the conditions were good." While the Kenyans tasted success, the SCSM also hoped that the success of yesterday's event would convince assessors from the World Marathon Majors series to allow Singapore to join Berlin, Boston, Chicago, London, New York and Tokyo in that exclusive club. While last year's route started at Orchard Road and took in the sights of heritage areas such as Little India, Arab Street and Chinatown, this year's course sent participants along the F1 Pit Building, West Coast Road, the Central Business District, Marina Barrage and East Coast Park. The men and women's elite wheelchair marathon also made its debut. Tan Kwang Yu, 25, ran the 21km race for the last two editions and he also completed the full marathon in 2013 and 2014. He gave the thumbs up to the "more refreshing" route, saying: "The paths were clear and there were lots of hydration points. There were a few elevations along the highway that might have been a bit challenging to less experienced runners, but this gives it a bit of excitement." Banjamin Quek, the third local finisher in the half-marathon (1:22:21), called it "good but tough". But he found himself stuck in a mass of bodies as he left the event. The 26-year-old said: "The management of the human traffic was bad. We needed to cross the run route to get to the public transport and this caused congestion and inconvenience for those trying to return home. There was also a long queue and bottleneck to cross over to the train stations. "However, I must applaud the prompt attention by the medical personnel. I was attended to immediately when I wasn't feeling well after crossing the finishing line." 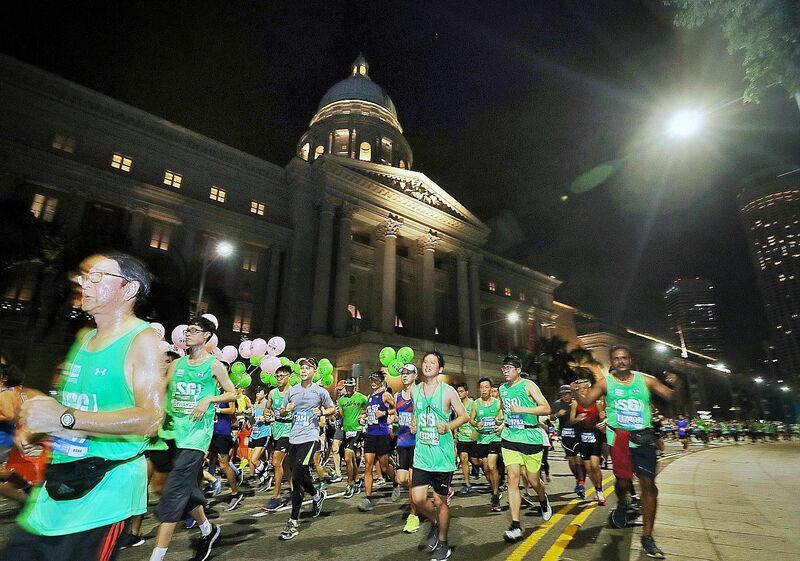 Runners made their way past the National Gallery yesterday as the city centre came alive at dawn with more than 30,000 enthusiasts pounding the streets during the Standard Chartered Singapore Marathon. The event, now into its 17th edition, attracted an overall entry of about 50,000, with several changes. It was the first time the event took place over two days, with the shorter distances (5km, 10km) held on Saturday. There was also a new route for the marathon, with athletes flagged off at the F1 Pit Building before making their way round the Central Business District, West Coast Highway, Marina Barrage and East Coast Park, before ending at The Float @ Marina Bay. Elite wheelchair marathoners also made their debut, with the field of 11 including Paralympic and World Marathon Major champions.